Manufacturer of a wide range of products which include vortex flow meter. 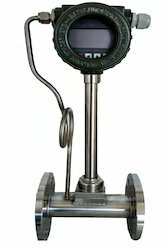 The Vortex flowmeter integrating flow, temperature and pressure detection function, and can automatically compensate for temperature, pressure, compression factor, such as petroleum, chemical, electric power, metallurgy industry ideal instrument used in the measurement of gas. At the entrance side put a set of spiral vane, when fluid into the flow sensor, guide vane forcing fluid produced dramatic spiral flow. When fluid into the diffuser, vortex flow under the effect of reflux, began as a secondary rotation, form the gyro type vortex precession phenomenon. The precession frequency is proportional to the flow size, not influenced by physical properties and fluid density, detecting element quadratic spin precession frequency measured fluid can be wide flow rate range for good linearity. Signal amplified by preamplifier, filter, converting plastic is proportional to the velocity of the pulse signal, and then with the detected signals, such as temperature, pressure are sent to the microprocessor for integrating process, the final measurement results on the LCD screen shows (instantaneous flow and cumulative flow, pressure and temperature data).